When we are not cooking, we love to hike when the weather is not too hot. There are many beautiful places to choose from around the Los Angeles area, and you don’t have to travel too far to escape the city. We can drive fifteen minutes outside of town, and find ourselves on private, serene trails lined with ancient oak trees, with sounds of running streams and fresh scents of sweet California sage filling the air. Some of our favorite spots are in Ventura, about an hour north of here, where the temperatures are cooler and long, winding trails overlook the Pacific ocean. Lately, since it has been way too hot for any of these activities, we have been busy at home working on new recipes for the blog. We have narrowed our list, picked the best of the best, and couldn’t be more excited to share this year’s Thanksgiving ideas with you. 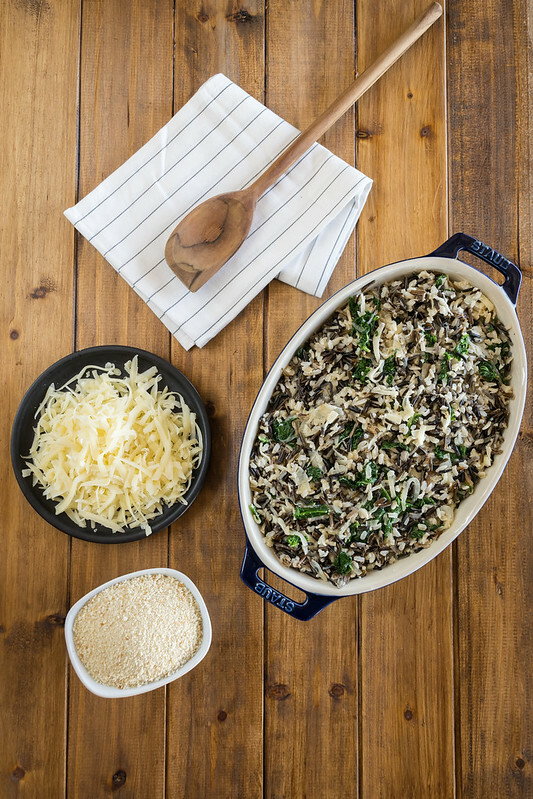 Allow us to start with number one: wild rice gratin with kale, caramelized onions, and emmentaler. We have been making this delicious dish from the Smitten Kitchen Cookbook since its release in 2012. When we were preparing to launch our site, this was one of the first meals we ever tried photographing. While the food was wonderful, the pictures were… not. Thankfully, we have learned a few tips since then, and those pinterest fails are now stashed away in a DO NOT OPEN folder on a hard drive that shall never see the light of day. But we have continued to enjoy this recipe, and are delighted to be sharing it today with photos that are more… presentable. 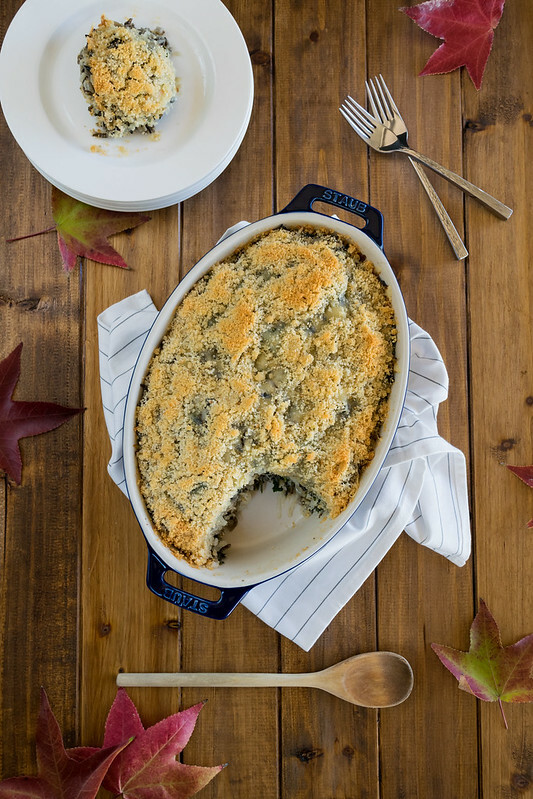 We can’t think of a better side to include for Thanksgiving than this comforting and deeply satisfying gratin. 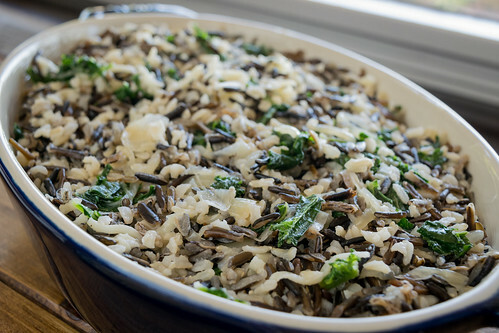 This hearty dish is filled with fresh tender kale and an abundance of sweet caramelized onions, tossed generously with savory, creamy emmentaler which perfectly complements the earthy and nutty flavors of the wild rice blend. It is then topped with seasoned breadcrumbs and cheese creating a crispy, crunchy, and irresistibly chewy topping. 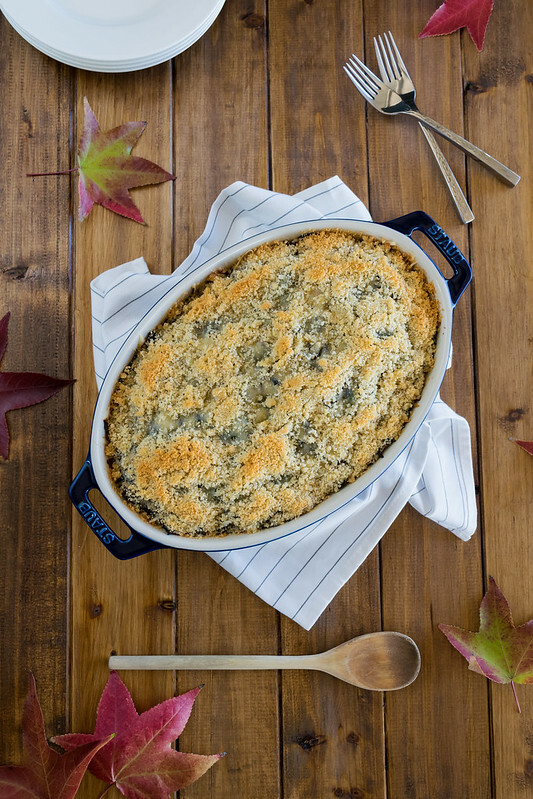 This cozy baked gratin makes a delicious light main course or an elegant side dish, and the warm, simple fall flavors will make it a welcome addition to your holiday table. Preheat oven to 375°F. Cook rice according to package directions. While the rice is cooking, place a large heavy skillet over medium-low heat. Add 1 tablespoon of butter and the olive oil, and once the butter is melted add the sliced onions. Sprinkle the onions with 1/2 teaspoon salt and 1/4 teaspoon pepper, then stir well to combine. Continue to cook, stirring occasionally, until the onions are soft and sweet, 30 to 35 minutes. Add the chopped kale and cook until slightly softened, about 2 to 3 minutes, then remove pan from heat. 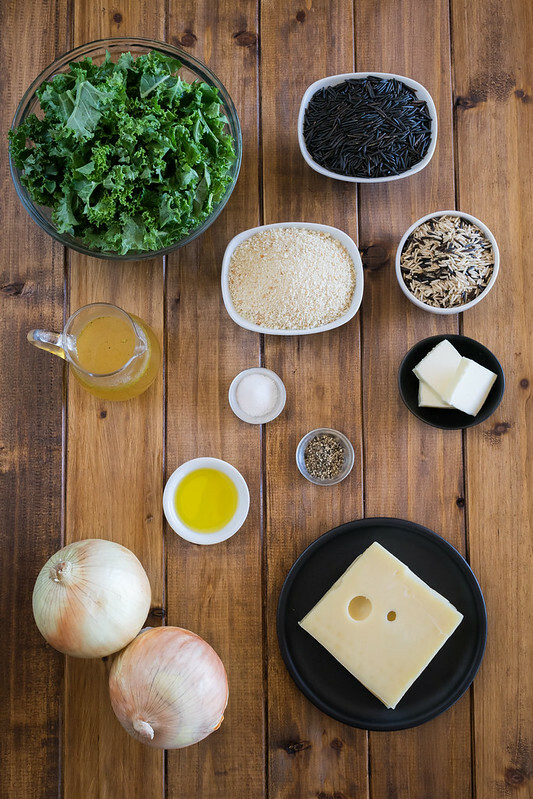 In a large bowl, combine the cooked rice, the onion-kale mixture, 1 cup of the cheese, 3/4 teaspoon of salt, and 1/4 teaspoon of the pepper, and stir well. 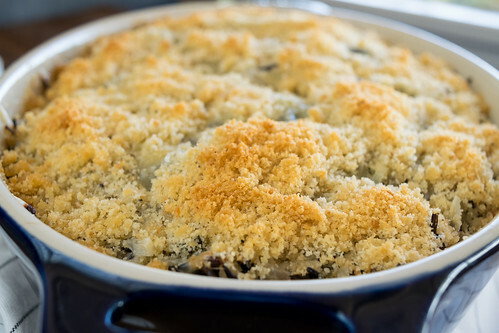 Use 1 tablespoon of butter to grease a 2-quart baking dish. 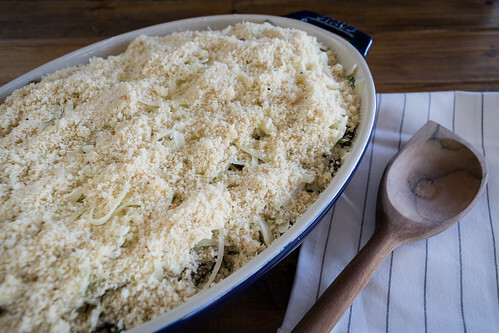 Scoop the rice-kale mixture into the baking dish, and spread it evenly. Pour the broth over the rice, then top it evenly with the remaining 1 cup of cheese. In a small bowl, toss the breadcrumbs with 1 tablespoon of melted butter, 1/4 teaspoon of salt, and 1/4 teaspoon pepper. 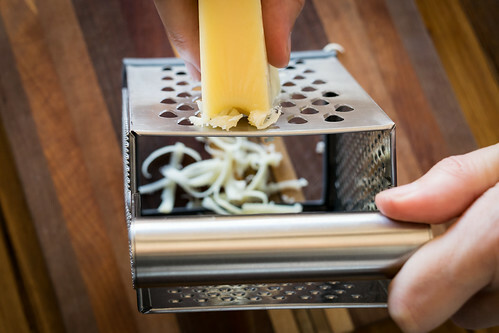 Sprinkle the breadcrumbs over the cheese. Bake for 30 to 35 minutes, until bubbly and slightly browned on top. Serve hot, and enjoy! Seriously?! Oh my goodness, this must go on my Thanksgiving table. I love your ingredients shot. I substituted rice and corn chex for the breadcrumbs (so it was gluten free) and this dish was still a favorite at the family dinner!! 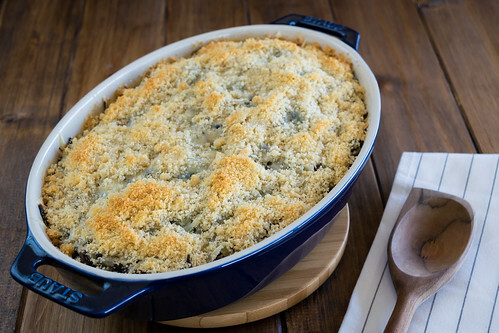 Thanks for a wonderful recipe that’s now a holiday staple! Thank you, MacKennea! We’re so glad you and your family enjoyed it! You have made our day!! And that’s a great idea about using chex as a GF alternative! Huge disappointment! 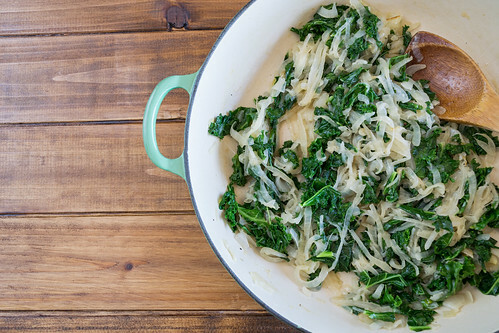 Originally intended to make some type of creamed winter greens but saw this recipe which I thought would be healthier and lighter. Pretty much stuck to the recipe except for using half wild rice and half quinoa. The flavor of the carmelized onions did not come through, the cheese flavor was too mild and did not add much so there was nothing to add to the wild rice and kale flavors which are not too exciting on their own. It was edible but I’m not looking forward to the leftovers tomorrow. Thanks for writing. We’re sorry to hear it didn’t turn out! Love the idea of mixing wild rice and quinoa though! What kind of cheese did you use for the recipe? If you find an emmentaler that’s flavorful and delicious even when eaten on its own, it should be more prominent in the final dish. Or if the cheese was mild, you could always try adding a bit more. Also, we’re curious why the flavor of the onions didn’t come through as it should be a prominent part of the dish. 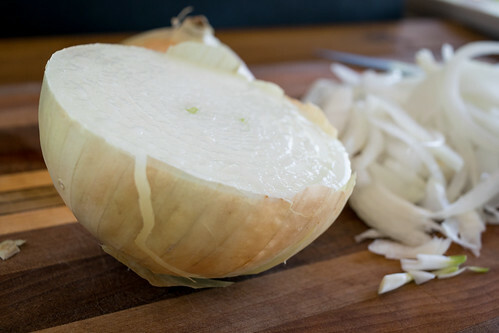 The longer the onions cook, the sweeter and more flavor comes out.